Premier Auto Trade has recently celebrated a significant milestone by adding the 700th part number to their range of automotive oxygen sensors. With over 700 Direct Fit Oxygen and Air Fuel Ratio Sensors the range is now suitable for over 13 million vehicles in the Australian and New Zealand car parc, making it the largest range in the Australian Aftermarket. The offering covers over 6400 vehicle applications suitable for Petrol, LPG and Diesel vehicles. Premier Auto Trade’s comprehensive range of oxygen sensors are manufactured by Walker Products USA and are backed by some of the best engineers in the industry. Walker Products began supplying the fuel system needs of the automotive industry in 1946 and are committed to supplying products manufactured to meet or exceed OEM standards and specifications. “We are pleased to be offering the largest range of oxygen sensors in Australia” said Jim Cots the Managing Director of Premier Auto Trade, “We remain focussed and committed to supplying the independent aftermarket with the most complete and comprehensive range of EFI and engine management components backed by the industries most trusted brands” he added. Today Walker Products is one of the largest privately owned manufacturers of fuel system components and engine sensors in the USA. As an ISO 9001:2008 / TS16949 certified company they are committed to supplying the highest quality products. The range of Walker Products Direct Fit Oxygen Sensors offer significant benefits over universal fit to both the workshop and the end user ensuring correct wire configuration. and reducing the chance of incorrect connections when joining different coloured combinations. Direct fit sensors also offer less chance of incorrect heater resistance being fitted to the vehicle, especially critical on later models, and are easier and faster to install. 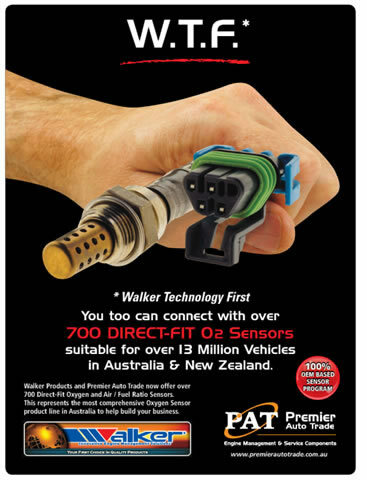 Walker Products Air/Fuel Ratio and Oxygen sensors are distributed in Australia by Premier Auto Trade through a network of specialised resellers and leading automotive retail groups.